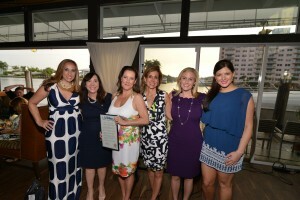 Voices for Children of Broward County was proud to host its Third Annual Soaring for Children Event on Thursday, May 15, 2014 at the beautiful new venue along the Intracoastal, Events by Grateful Palate. The Soaring for Children Event was not your traditional sit-down event but rather a fun celebration, hosted by Gia Tutalo-Mote, founder of Forever Families, and featured delicious cuisine, live entertainment and art, lavish silent and live auctions, tours of beautiful yachts, and magnificent waterfront views. This year, we had the privilege of honoring Angelica Palank-Sharlet as the 2014 Voice of Distinction for her commitment to the organization and to Broward’s children. Ms. Palank-Sharlet is the Founding Director of The Paul Palank Memorial Foundation, which has awarded numerous grants to Voices and recently provided the seed money for the Voices for Children’s Endowment Fund with a $100,000 gift. This fund will ensure Voices will continue, in perpetuity, to support the Guardian ad Litem Program in its efforts to advocate on behalf of, and serve the needs of, abused, abandoned, and neglected children in the care of the State in Broward County. In attendance at the celebration were event co-chairs Amy Goldin and Arielle Capuano, Angelica Palank-Sharlet, State Representative Lori Berman, State Senator Ellyn Bogdanoff, Senator Nan Rich, Mayor Peter Bober, Judge John Frusciante, Judge Mindy Brown, Guardian ad Litem Circuit Director Hilary Creary and NBC’s Gia Tutalo-Mote. Joining them were over 300 hundred business and community leaders, including a special presentation made by Representative Katie A. Edwards honoring Angelica Palank-Sharlet for her commitment to the community. Thanks to our generous sponsors and supporters, Voices for Children was able to raise over more $70,000 to support Broward County’s Guardian ad Litem Program, which advocates for abused, neglected and abandoned children in the care of the State. Voices for Children of Broward County is grateful to the following sponsors for their generous support: Hydraulic Supply and Eaton Hydraulics, Jim and Donna Inglis, Hunter Douglas, Cruise Industry Charitable Foundation, Setnor Byer Insurance & Risk, Unwin Moore Children’s Voice Fund of the Community Foundation of Broward, Kofsky Hartman & Weinger, PA Certified Public Accountants, Pam Tindall and Tindall Growers, The Amazing Women, PNC Bank, Royal Caribbean Cruises Ltd., Resolve Marine Group, Inc., PeytonBolin PL, Real Estate & Association Attorneys, Triumverate Environmental, Total Marine Solutions, Titos’s Handmade Vodka, Slainte Wines, Lifestyle Media Group, James Ross Advertising & Interactive, Bullseye Strategy, Celebrity Cruises and Denison Yacht Sales. To view a special video created at event, please click here. To view additional photos, click here.